Highly effective and reef safe. 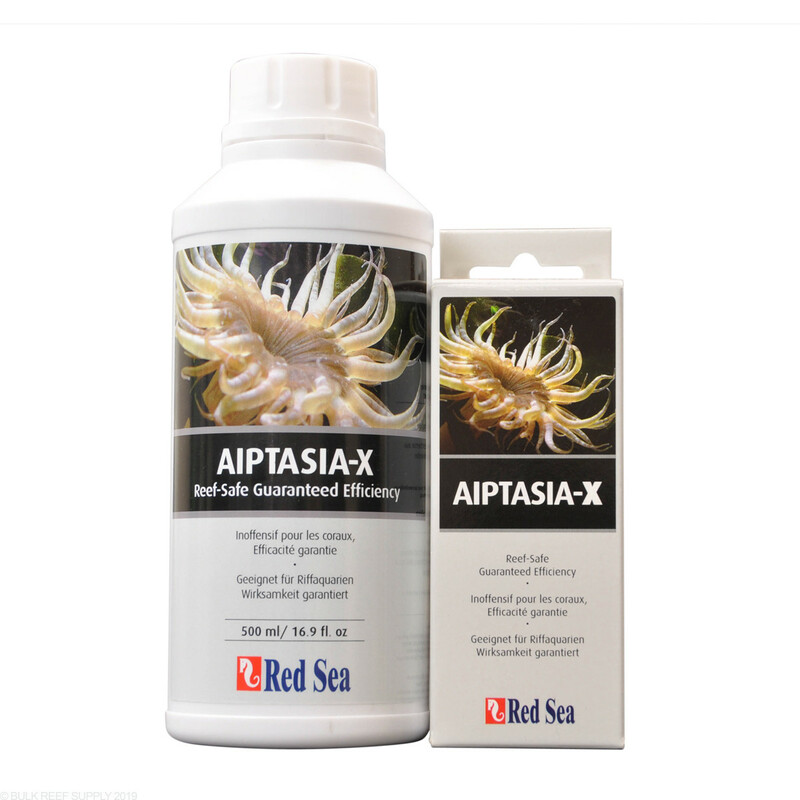 Aiptasia-X eradicates Aiptasia and its larvae from your tank. The special formula of natural components form a thick, adhesive material which, once ingested, seals shut the mouth of nuisance anemones. Shortly after ingestion, the material causes the Aiptasia to implode and destroys the anemone and its planula. In an exciting development for reef-keepers Red Sea has developed a unique patent-pending formula to treat the pest anemones Aiptasia sp., Anemonia majano and Boloceroides sp. Aiptasia (otherwise known as glass anemones) are often introduced via live rock or corals and can quickly reach plague proportions in marine aquaria, destroying corals and other marine livestock with devastating effect. Existing treatments are often unsuccessful as when threatened Aiptasia quickly retract into holes in the rock and release planula (larvae) into the aquarium which can rapidly develop into full anemones. Additionally, any part of the anemone’s body left attached to a rock can regenerate into a full anemone. Many treatments can, therefore, lead to a proliferation rather than the removal of Aiptasia. 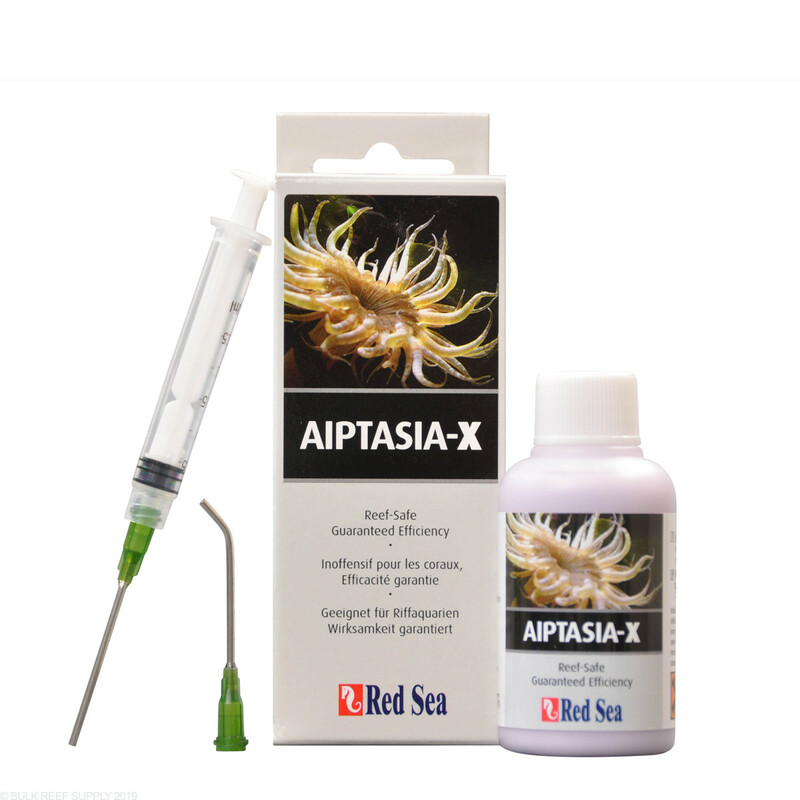 Through research and development carried out by Red Sea Aiptasia-X was created. This product overcomes the problems usually associated with Aiptasia treatments thanks to its unique formula. Aiptasia-X consists of natural components which form a uniquely thick, adhesive material. Instead of causing the Aiptasia to feel threatened, the unique formula is sensed as food stimulating the anemone to expand and ingest the material. The adhesive form of the treatment makes both the application of the material easy as well as sealing the anemone’s mouth preventing any release of planula. Within minutes of applying the material, the Aiptasia will implode, eradicating both the anemone and its planula. 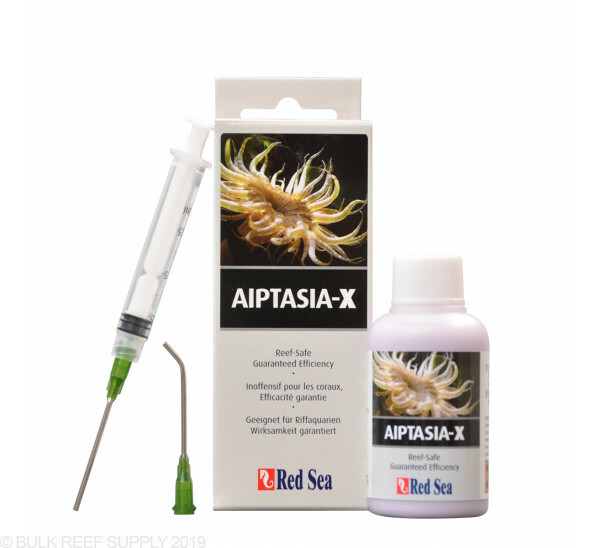 Red Sea’s new treatment is completely reef-safe and any material not ingested by the Aiptasia is harmless to sessile invertebrates. Excess material will decay harmlessly over time without any adverse consequences. Easy to use and highly effective, Aiptasia-X provides a solution long sought-after by almost every reef-keeper at one time or another in the life of their aquarium. The Aiptasia-X kit includes a 60ml bottle of material plus an applicator set consisting of a syringe with 2 (straight and angled) lock-on applicator tips enabling treatment of even the most inaccessible of anemones. The 60ml provided in the kit should be sufficient to treat approximately 100 Aiptasia anemones. Very effective to kill aptaisia, but don’t expect miracles. If you’ve got one you probably have more and they seem to just appear out of nowhere. I go on a rampage every few months when suddenly I have several and then keep an eye out for survivors the next week or so. Best to keep off of other corals as I have killed zooanthids and bleached some spots on my montis when the debris from the application drifts onto them. Best to stop all circulation for an hour to let the stuff stay where you put it. We’ve using Aptasia X for years. It does the job as well as I can expect. I don’t count on it to completely iradicate but it definitely helps keep the population under control. While this treatment is something you can use to control the population of aiptasia, it is not the permanent solution since aiptasia's usually come back and you end up forking $12 each time to eradicate these annoying critters. You're better off saving that money, starting off fresh and putting it towards a legit quarantine tank where one should quarantine the fish and corals! Dip and quarantine folks...I haven't ventured off into using Berghia nudibranchs as they are costly online and the LFS typically do not carry these...Quarantine! This the Ultra low maintenance method! Although their package says reef safe, It's not! Especially if you have Anemones - Aiptasia is an Anemone = if this kills Aiptasia it'll kill your bubble tip and any other anemone you have. Ask me I lost 4 this week. Another company that makes great claims but hides when confronted. Buyer beware - fragile corals, anemones or rare CUC - don't buy this stuff. BRS will probably not post this but it's on Reef2Reef and other sites as reefers need to know about this "snake oil"
I had a single glass nem in the heart of a zoa colony, very hard to get to. Got it with this stuff and it worked! Didn't kill any of my zoa polyps either. Seems to work fine for removing individual aiptasia. I still get one or two popping up every so often but considering I have a 150 gallon tank that had many that's acceptable to me. I just target the ones that appear which is only every few weeks. Doesn't seem to cause any negative effect on anything else in my tank. I tried lemon juice kalk paste and boiling water and this works much better. Have used several applications of this only to have the aiptasia come back in larger numbers. Works temporarily. Always seem to come back and pop up in the same place or somewhere different. Best way is to remove the rock completely for a period of time (if possible),, but the product will work for the time being. Excellent product ... If you see one Aptasia ... trust me you'll see more . Keep some Aptasia X on hand and target and kill them no matter how small . No effect on fish or corals , however try to keep it off mushrooms .. they don't seem to like it at all . I treated my outbreak and RED SEA AIPTASIA-X is easy to apply and it never comes back. It has been several weeks. I even purchased a larger bottle for later. Didn't harm my tank or fish. A good buy. Can this product be used to kill spreading xenia. This is not intended for eliminating Xenia and while it may impact the, it would most likely not eliminate them. Ideally manually removal, or even harsh treatment like mixing a sludge of Kalkwasser will help to kill Xenia well. Feel free to let us know if you have any further questions! The shelf life is basically indefinite just as long as nothing foreign is introduced into the bottle. I'm assuming since its considered reef safe that it wouldn't hurt my bubble tip anemones?